After the purple-blue of November's jacarandas, it's December and agapanthus season. They're everywhere, undaunted by the rainy days we've been having, glorious purple-blue with bud after bud opening on each flowerhead. Oh, you're back. Hello! 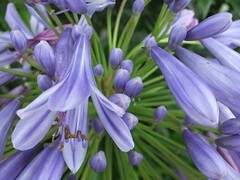 I love agapanthus but they're a bit tender here, in cold winters.